Whilst we use the best sources of timber available to us, when constructing your garden gym, it is almost inevitable that cracking/splitting (known as checking) will occur weeks or months after installation. This can be especially prevalent during the hot summer months. Splitting timber is a common concern for all! We use several companies in the UK to supply timber and we have found that ALL of the timber used regardless of the source is susceptible to ‘splitting’ or ‘cracking’. This is a problem that ALL timber suppliers face and all suppliers of play equipment and gazebos etc. The information provided here is to give you an understanding of what to expect after you have our installation team install your gym. What to expect after your outdoor gym is installed? The following images show how the wood can crack/split usually during the summer months as the wood dries /adapts naturally to the outside environment. In 99% of all cases the cracks, which may appear as defects, will NOT affect the structural integrity of your gym. At times, as the weather heats up, the cracks can appear almost overnight and at first can be somewhat alarming. But this is the nature of wood. This is something that will most likely happen but it is not something to be alarmed about. Because the cracks often run down the centre of the wood it can look like the bolts that attach the pull up bars to the posts are causing the wood to split. This is NOT the case. We also DON’T want you to just take our word for it. So below are links to other website that discuss in detail ‘Checking’ (cracking/splitting) of wooden posts. As the structural integrity is NOT affected the short answer is you don’t have to do anything. However from an aesthetic perspective this an area that we are currently investigating and will be updating this page over the coming weeks. 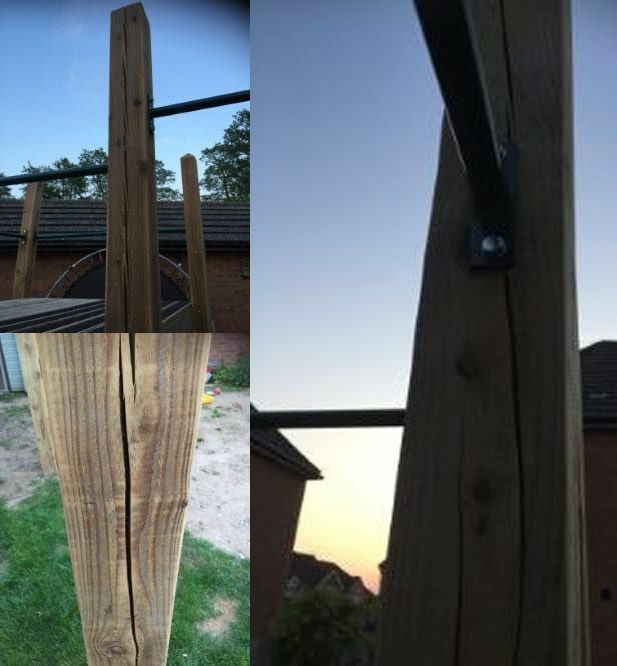 Whilst the posts are pressure treated for outdoor use, we do as standard recommend applying an oil based stain or weather resistant treatment to the timber posts on an annual basis as part of your general maintenance program (more of which is discussed as part of the installation process). The oil can be easily applied to penetrate into the cracks to help in the overall preservation of the timber. If after reading this article you would like cancel your order prior to installation or delivery of DIY products then you will be entitled to a 100% refund.